Seven-year-old Kyle Yniquez was so lucky because he was recently awarded as the first winner of the Bonakid Choco Boost Amazing Toy Adventure Promo. Because of his speed, agility and strategic thinking, he was able to fill up five shopping carts with toys amounting to around P100,000 from Toy Kingdom. His father found the winning sticker from the Bonakid Choco Boost box he bought as soon as the promo started. An avid Bonakid Choco Boost drinker since late last year, Kyle was able to get the toys he wanted, and being an only child, he is excited to share his brand new toys with his cousins. 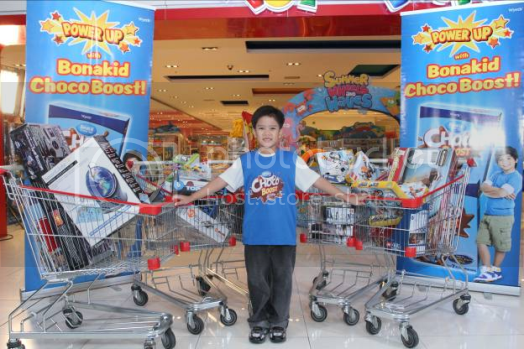 Kyle’s fun and exciting shopping spree was made possible by Bonakid Choco Boost. With high levels of Calcium, Zinc and Iron, Bonakid Choco Boost provides children with the nutrients needed for optimal growth and development to power up their daily activities into everyday adventures. The Bonakid Choco Boost Amazing Toy Adventure Promo ended last May 31, 2013. Visit the Bonakid Choco Boost Facebook page for the announcement of the other winners. This entry was posted in Bonakid Choco Boost, Bonakid Choco Boost Amazing Toy Adventure Promo, Press Release. Bookmark the permalink.